Standard time has its roots in ancient Babylonia, in what's now called Iraq. The Babylonians divided the daylight into 12 hours, and the night also into 12 hours, thereby originating the 24-hour day. These hours were variable, as the days and nights changed in length throughout the year. The number 12 was an important part of their astrology, there being twelve stations in the zodiac, corresponding with each hour of the night. The Babylonians also used a sexigesimal number system, in which they counted in groups of 60. Since the year is divided into about 360 days, they divided the circle into 360 (6x60) parts, each of which was subdivided into 60 small parts, and each subdivision was further divided into 60. Later, these subdivisions became known in Latin as pars minuta prima (1st small part) or "minute", and pars minuta secunda (2nd small part) or "second". Centuries later, as mechanical clocks became more accurate, these terms were used to divide hours of the day, as well as degrees of a circle. The Babylonians also named days for the 7 planets, as they then counted them: sun, moon, Mercury, Venus, Mars, Jupiter and Saturn, creating the seven-day week. The ancient Chinese used clepsydras or water clocks to divide the day into 100 units called ke, each equal to 14 minutes and 24 seconds, which existed alongside a system which divided the day into 12 double-hours, named for the "earthly branches". After European time was introduced, a quarter-hour came to be called a ke. XI. Le jour, de minuit à minuit, est divisé en dix parties ou heures, chaque partie en dix autres, ainsi de suite jusqu’à la plus petite portion commensurable de la durée. La centième partie de l'heure est appelée minute décimale; la centième partie de la minute est appelée seconde décimale. Cet article ne sera de rigueur pour les actes publics, qu'à compter du 1er. du premier mois de la troisième année de la république Vendémiaire, l'an trois de la République. Thus, French decimal time was originally defined simply as a decimal fraction of the day, which was later modified with the definitions of decimal time units (decimal hours, minutes and seconds) to resemble traditional timekeeping. 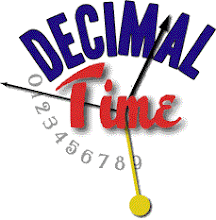 Each multiple of ten decimal minutes was sometimes called a décime, because it was one-tenth of a decimal hour, and which was conveniently close to an old-style quarter-hour. On March 28, 1794, the president of the commission which developed the metric system, Joseph Louis Lagrange, proposed in a report to the commission the names déci-jour and centi-jour (deciday and centiday in English) but these were not adopted because decimal time units had already been established. On August 22, 1794, a contest was held for designs to convert clocks and watches to the new style, to be judged by Ferdinand Berthoud, Antide Janvier, and Jean Antoine Lépine. Clocks and watches were built with decimal dials, most displaying both 10 and 24 hours. The hours were numbered 1-10, with 10 for midnight and 5 for noon. Art. 22. La disposition de la loi du 4 frimaire an 2, qui rend obligatoire l'usage de la division décimale du jour et de ses parties, est suspendue indéfiniment. Article 22. The provision of the law of Frimaire 4 year 2 (November 24, 1793), which rendered obligatory the usage of the decimal division of the day and of its parts, is suspended indefinitely. However, although it was no longer mandatory, official records, such as births, deaths and marriages, continued to be recorded with decimal times in some parts of France for a number of years, including Marseille and Toulouse. The 10-day décades were replaced with 7-day weeks in April of 1802, and the Gregorian calendar finally reinstated on January 1, 1806. In the 1890s, M.J. de Rey-Pailhade, a civil engineer from Toulouse, proposed dividing the day into 100 centijours, abbreviated cé, which he further divided into 10 decicés and 100 centicés. Decimal time was used in Toulouse during the Revolution. The French made another attempt at the decimalization of time in 1897, when the Commission de décimalisation du temps was created by the Bureau of Longitude, with the mathematician Henri Poincaré as secretary. The proposed unit of time was the standard hour of 1/24 day, divided into 100 minutes, and each minute into 100 seconds. However, this effort failed to gain any acceptance. During the French Revolution, the astronomer Pierre-Simon Laplace embraced decimal time and expressed the time in the form of fractional days in his Traité de Mécanique Céleste. Astronomers have continued using this form of decimal time ever since. For instance, in 1849, the British astronomer, John Herschel, published Outlines of Astronomy, describing fractional days and also introducing a system of decimal dates, by counting days of the Julian Period. Astronomers began adding fractional days to Julian Days, which together are called Julian Dates. Astronomers back then started and ended the day at noon, so Julian Dates also started and ended at noon, as observed in Greenwich, England, where the Prime Meridian was agreed to cross by an international conference in Washington, DC, in 1884. Since 1925, astronomers have started and ended the day at midnight, Greenwich Mean Time, so astronomers introduced Modified Julian Dates and other variations which are synchronized with the Universal Day.